The Internet Channel for Nintendo Wii gaming console is a version of the Opera 9 web browser for use on the Wii by Opera Software and Nintendo. By downloading and installing Internet Channel on Nintendo Wii, gamers and players can browse and surf the Internet web pages directly from Nintendo Wii. A handy home page with easy access to search engine, favorite websites, and onscreen keyboard. QWERTY or compact cellphone-style keyboard with predictive typing from Wii Remote. Ability to save favorite websites. Uses a wireless (Wi-Fi) internet connection (set in the Wii Settings) to retrieve pages directly from a web site’s HTTP or HTTPS server. The browser was used to price at 500 Wii Points (US$5). But Nintendo has since made Internet Channel available for free download at 0 Wii Points from Wii Shop Channel as one of the WiiWare. 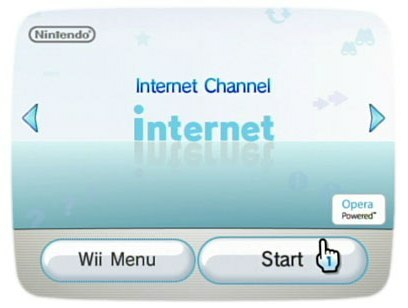 Internet Channel can be downloaded to either Wii System Menu or SD card. In fact, Nintendo Wii owners who previously purchased Internet Channel for 500 Wii Points are offered a compensation worth 500 Wii Points, which allowing them to download and install a free Nintendo Entertainment System (NES) game of their choice from the Virtual Console catalog, between October 1st and December 31st 2009. User can access this offer by pressing the “One Free Title” button on the top screen of the Wii Shop Channel.